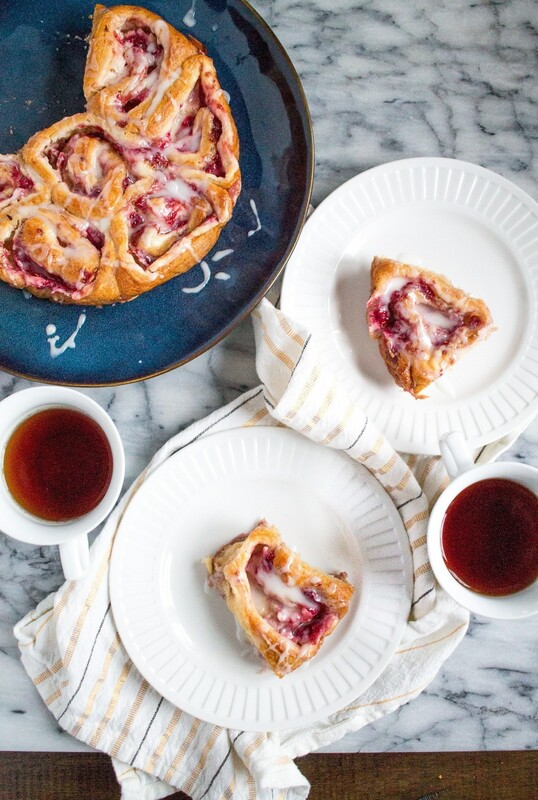 This Raspberry Cream Cheese Danish is an easy to prepare breakfast treat that takes just 10 minutes of active preparation time. 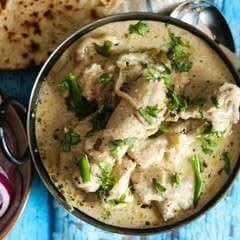 It is a weekend breakfast your family will love. 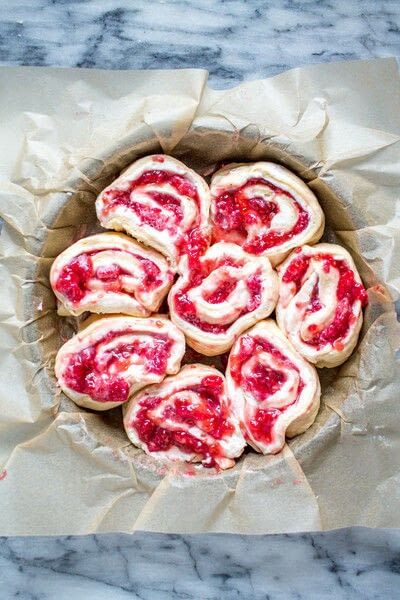 Cream cheese filling, fresh raspberries, and jam are rolled up in store-bought crescent roll dough to make these Raspberry Cream Cheese Danishes. The fresh fruity flavor from the raspberries contrasts perfectly with the cream cheese making these danishes irresistible. They would be an excellent addition to a brunch. Heat your oven to 325 degrees, and line an 8-inch round cake pan with parchment paper. Using an electric mixer, combine the cream cheese, mascarpone, vanilla, and powdered sugar. Beat until combined and soft. Next, chop the raspberries, pour them into a bowl and stir in the jam. Lay the crescent dough out on a floured work surface. Use your finger to pinch the precut lines on the dough together. Then spread the cream cheese out in a thick layer. Next, spread the raspberry mixture on top. Roll the dough up. 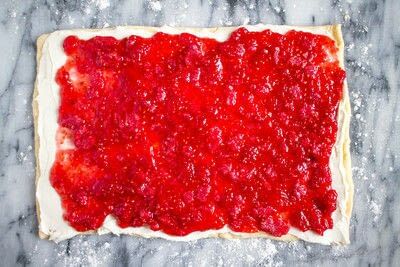 Some of the raspberry filling might fall out, but that is ok. Use a sharp knife to slice the dough into pieces about 1 inch thick. Arrange the slices in the parchment-lined cake pan. Bake the danishes at 325 degrees for 35 minutes. Then reduce the heat to 250 degrees and let bake for an additional 15 minutes. Then remove from the oven and let cool. While the danishes are cooling, prepare the icing by whisking the powdered sugar, butter, and milk together. Drizzle the icing over the danishes and serve.